Honda Motor Co., Ltd. today announced its plan to start its Electric Vehicle Testing Program with Saitama Prefecture for its next-generation personal mobility products, including electric vehicles (EVs), plug-in hybrid vehicles, electric scooters, and electric carts. 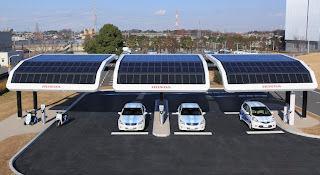 The specifics of the testing program, testing vehicles, and solar-powered charging stations made their public debut in Japan. Conducted in real-world urban transportation environments, the program will focus on motorcycles, automobiles and power products based on electromotive technologies. The comprehensive program will also use advanced communications & telematics and solar-powered charging technologies to explore future forms of personal mobility and their potential of CO2 emissions reduction. The practicality and convenience of electromotive technology featured on next-generation personal mobility products, including Honda's EVs and plug-in hybrid vehicles, the EV-neo electric scooter and the Monpal ML200 4-wheel electric cart. The effectiveness of solar power generation and other renewable energy sources in helping to realize a low-carbon mobility society. The effectiveness of advanced communications & telematics to enhance customer convenience and product usability. Based on the results of the program, Honda plans to further advance its electromotive technologies for personal mobility products. In combination with Honda's strong position in solar panels, cogeneration systems and other energy-generating products, these electromotive technologies will help Honda work together with customers to achieve the goal of "Total Energy Management", a system that supplies households and communities with energy for personal use, while supporting a comfortable, low-carbon lifestyle. Earlier on December 15, 2010, Honda announced this Electric Vehicle Testing Program in the United States (Torrance, California). In addition to Japan and the United States, Honda is considering the possibility of conducting a similar program in China.